I remember the day I watched it, I had been doing a similar thing with old newspapers and magazines, crossing out words leaving a story or poem with those left behind. I started this when I was drawing illustrations on old text books thinking I was being original. The news wasn’t to hardly taken though, that it had been done many times over, because that was exactly what this guy had thought. I remember I was on a roll this day,and I copied all this cool stuff into my sketchbooks. 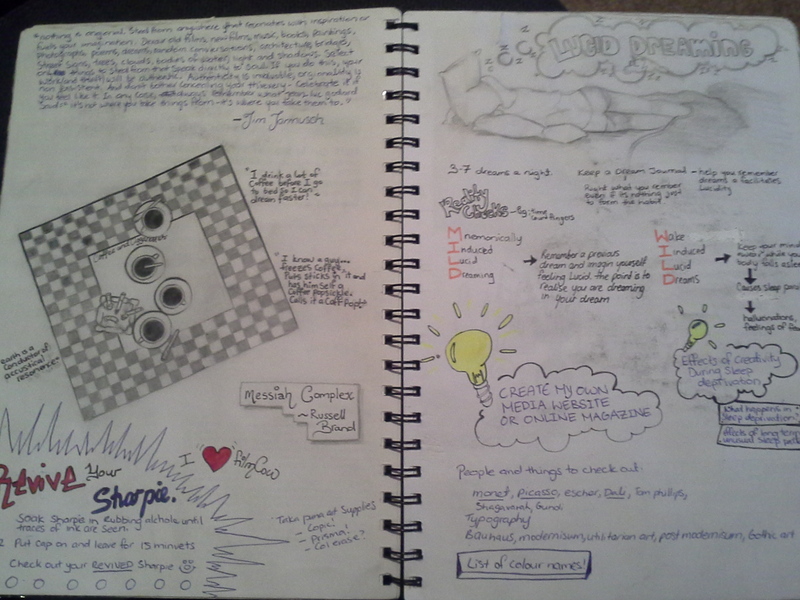 Notes and sketches about lucid dreaming, sleep deprivation, reviving sharpie pens, zentangling and it was even the day I found Russell Brands political videos such as the messiah complex, the interview for BBC news and MSNBC where he showed them up as complete idiots! I realized this was all I wanted to do for the rest of my life, I’d be a Blogger. Needless to say, one or two videos set off a snowball effect off research and now here I am. Getting off my lazy bum, not sleeping all day and working for the life I want to have 😉 Above is my old sketchbook on the exact page!